1942 was twice tragic for Leningrad. Invasion of rats was added to the hunger daily claiming hundreds of lives. Eyewitnesses remember that rodents moved around the city in huge colonies. When they were crossing the road, even trams were forced to stop. All types of weapon, bombardment and fire's light out to be bedrid in destroying the "fifth column" eating around the blockade survivors dying of hunger. Gray creatures devoured even those remains of food that remained in the city. Besides, because of hordes of rats there was a threat of epidemics in the city. But none "human" methods of fight against rodents were successful. And there were no cats in the city for a long time — the main rat's enemies. They were eaten too. "In our family the situation was that the uncle demanded cat Maxim on dinner very nearly day. Together with mother when leaving house, we locked Maxim in the small room. We also had a parrot named Jacques. In good times our Zhakonya sang and talked. And then from hungerhe crawled round and became silent. A few sunflower seeds that we exchanged for father’s gun came to an end soon, and our Jacques was doomed. Cat Maxim hardly wandered too - the wool got out in shreds, claws were dirty, he ceased even to mew, eliciting food. Once Max managed to get into Zhakona's cage. In other time there would be a drama. But here we saw, having come back home! The bird and cat were sleeping in the cold room, nestling to each other. This situation amazed uncle so much that he ceased encroach on cat..."
"We had a cat Vas'ka. He was the fair-haired boy of our family. In winter of 41st mother carried him somewhere. She said that she carried our cat to the refuge and there they will feed Vas'ka wish fish, as we are not able to do this... In the evening mother cooked something like cutlets. Then I was surprised that we had a meat. I didn't understand the situation... Only then... It turns out that thanks to Vas’ka we survived that winter..."
"The glasses crashed out from the house during the bombardment, the furniture was fused long ago. Mother was sleeping on a window — it was wide as a bench — taking cover an umbrella from rain and wind. Once someone, got word that my mother was pregnant, presented her a herring — she wanted salty so much… At home mother put a gift in a secluded corner, hoping to eat it after work. But having returned in the evening, she found a tail and fat spots from herring on a floor — the rats feasted it for a while. It was a tragedy which only those who endured blockade are able to understand" - the employee of the reverend Serafim Sarovskyi temple Valentina Osipova says. Nevertheless, some citizens, despite a cruel hunger, regretted their favourites. In the spring of 1942 the old woman, half-dead for hunger, took out her cat on the street to take a walk. People approached her, thanked that she saved the cat being alive. One former blockade survivor remembered that in March, 1942 she suddenly saw a lean cat on the city street. Around the cat there were several old women making the sign of the Cross, and the militiaman, thin, like a skeleton, was preventing a small animal from being caught. The 12-year-old girl in April, 1942, passing by "Barrikada" Movie Theater, surprised a crowd of people at the window of one of houses. They marveled at an unusual show: on the window brightly shined with the sun there was a striped cat with three kittens. "Having seen it, I understood that we survived", - this woman remembered many years later. As soon as blockade was broken, there was a resolution signed by the chairman of Leningrad Soviet on need for "extracting from the Yaroslavl region and delivering smoky cats to Leningrad". Residents of Yaroslavl could not default with the strategic order and the necessary quantity of the smoky cats that were considered as the best rat catchers were caught. Four cars of cats arrived in the half-ruined city. A part of cats was relieved right there at the station, a part was distributed to inhabitants. The cats were snatched away instantly, and cats were not enough across-the-board. 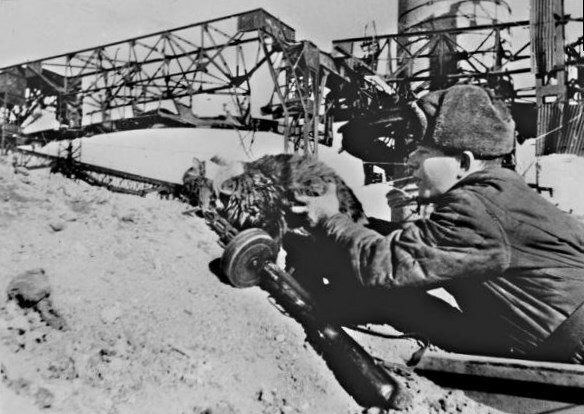 L. Panteleev wrote in the blockade diary in January, 1944: "The kitten in Leningrad costs 500 rubles". The kilogram of bread then was handily sale for 50 rubles. The watchman's salary was 120 rubles. - For a cat we gave the most expensive thing we had — a bread. I left a little from my ration to give this bread for a kitten to the woman whose cat was lambed— Zoya Kornil'eva remembered. The cats arrived in the half-ruined city at the expense of heavy losses in return managed to banish the rats from food dumps. Cats not only caught rodents, but also were at war. There is a legend of a red cat who got accustomed at the antiaircraft battery standing near Leningrad. 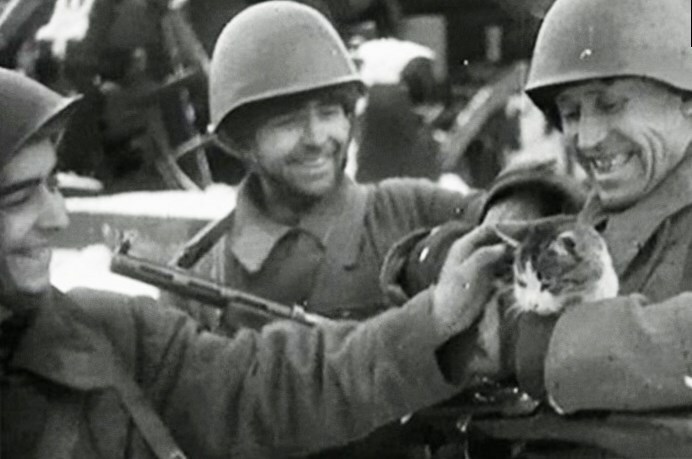 Soldiers named him "sluhach" as the cat precisely predicted the approach of enemy planes by its «miaow». At that the animal let pass the Soviet planes without remark. The cat was even attached for administration and they detached one private to look after him. One more "party" of cats was delivered from Siberia to struggle with rodents in cellars of the Hermitage and other Leningrad palaces and museums. 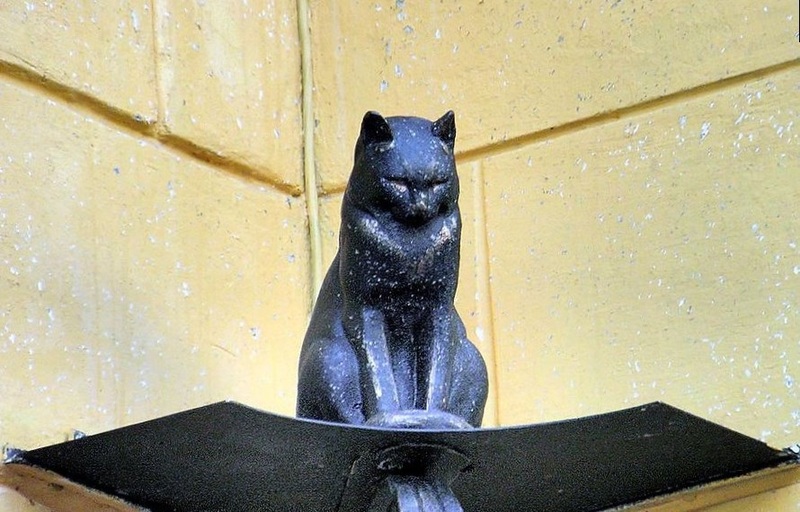 It is interesting that many cats were domestic — residents of Omsk, Irkutsk, Tyumen. People brought them on assembly points to help Leningrad residents. In total 5 thousand cats that coped with their task with honor - cleared the city of rodents, were sent to Leningrad, saving the remains of edibles for people, and saving people — from epidemic. Descendants of those Persian cats live in the Hermitage to the present day. People take care for them, feed them, treat, but the most important thing - people respect cats for honest work and help. And a few years ago even the special Fund of cats' friends was created in the Hermitage museum. Today there are more than fifty cats serving in Hermitage. Every cat has a special passport with photo. All of them successfully protect museum pieces from rodents. 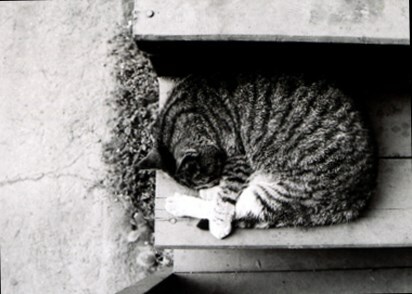 Cats are recognized by sight, from a back and even from a tail by the museum staff.